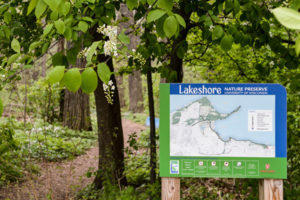 Whether you have just an hour or a whole day, exploring the Lakeshore Nature Preserve lets you re-connect with yourself—and with nature. 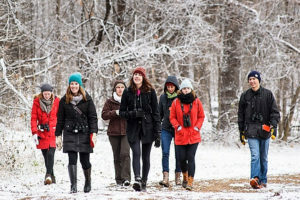 While the Lakeshore Nature Preserve provides opportunities for outdoor recreation, its main priorities are to protect natural and cultural resources and to serve as an outdoor laboratory for teaching and research by UW-Madison students, faculty and staff. Certain activities that conflict with these priorities are not permitted. Before your visit, please review Visitor Etiquette. Take the classic Picnic Point walk. Park your car or bike at Picnic Point Lot 129 and walk the Lakeshore Path to the tip of Picnic Point. Stop at benches along the way to take in the view. Make sure to do the “portage walk” across the Narrows from shore to shore—though the portage will take you only about 15 seconds! Stop for a peaceful gaze on either side of the portage. A drink at the bubbler tops off the classic Picnic Point walk. Want a beautiful lakeside walk? From Memorial Union, stroll the water’s edge on the Lakeshore Path to Willow Creek Woods and back. Take the historic Bascom Hill tour. Visit Muir Knoll and its class monuments, look for the Brittingham Rune Stone, and stroll through Muir Woods. Walk to the Council Ring by Elizabeth Waters Hall, and then visit Washburn Observatory and Observatory Hill to take in the view from the crest of the hill at the old Washburn Observatory from which the hill takes its name. Discover Raymer’s Cove. Drive or bike to the Raymer’s Cove parking lot off of Lake Mendota Drive near Eagle Heights Apartments. Take the stairs down to the water’s edge, where the sandstone cliffs meet the lake and the waves lap a pebbled beach. It’s especially beautiful at sunset. Stroll up and down the Lakeshore Path on either side of Raymer’s Cove for peaceful views and great wildlife viewing. Just driving and viewing? From Memorial Union, take Observatory Drive and pause at the Observatory Hill overlook. Follow Observatory Drive to Walnut St. Turn right and follow Walnut Street along University Bay. Turn right at University Bay Drive and drive past the Class of 1918 Marsh and the stone wall at the Picnic Point entrance. Turn right at Lake Mendota Drive and tour through the woods and natural areas of Eagle Heights. Take Eagle Heights Drive back to University Bay Drive. Make it a Preserve picnic. To reserve a fire circle picnic site, visit union.wisc.edu/firepit. Buy a picnic lunch from the Memorial Union and hop on the FREE Campus 80 Bus. Ride it all the way to Picnic Point or to the last stops in Eagle Heights Apartments. Once you’re there, enjoy your picnic and then explore the trails, community gardens, and restorations before taking the bus home. Campus 80 bus stops occur all along the route on Lake Mendota Drive. Have a long romantic walk. For a much longer walk with your special someone, stroll west along the water’s edge on the Lakeshore Path all the way from Memorial Union to the tip of Picnic Point and back. This is probably the best loved (and most romantic) walk for anyone who has ever spent time at UW-Madison. If you’ve got the better part of the afternoon to spare, you can continue all the way to the western end of the Lakeshore Path in Wally Bauman Woods and then climb to the top of the bluff in Eagle Heights Woods before returning home. You can head south from Eagle Heights Woods, past Big Woods to the Class of 1918 Marsh before retracing your steps along the Lakeshore Path back to the Union…a round trip of more than 9 miles. If you want to cut the walk in half, catch the Campus 80 Bus at the Class of 1918 Marsh Lot 130 and ride back to the Union. Got kids? Picnic Point is the place to go! Got little children who love to romp on grass? The lawn inside the entrance to Picnic Point is a great place to observe nature including pollinators in the adjacent rain gardens while you watch other visitors running and walking on the trail below. Like poking along the water’s edge? It’s easy to find lake-level shorelines on Picnic Point. You can get right to the edge of shallow water where you can play with sticks and see wildlife from secondary trails off the main trail. If you want sand to play in and rocks and washed-up logs to investigate, walk towards the tip of the Point and take the first major path to the left (north) to find the old beach house and the sandy beach that extends along the north shore. If you want more sand, sun, and rustic toilets, continue east along the shore to visit the Narrows—where Picnic Point becomes so thin that you can see both the University Bay and Lake Mendota at the same time. Want to try an old-fashioned pump and picnic? If you want to drink water from an old-fashioned hand-powered drinking fountain (we call them “bubblers” here in Wisconsin), continue just past the Narrows to the old pump on your left at the top of the hill. Kids love to work the pump to have a cool drink! If you’d like, reserve a fire circle ahead of time or take your chances at finding an unoccupied site and enjoy a picnic. That is, after all, how this place got its name! Does your child have a special interest in nature? 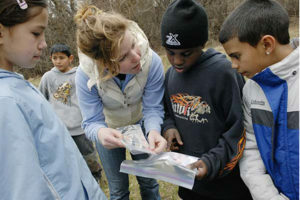 Check out the field trips offered by the Friends of the Lakeshore Nature Preserve. Or check out the insect photo album, and see what the kids can discover. See also the hints in the next section for a wildlife visit. Combine a visit to the Preserve with beautiful gardens and ice cream! Buy some UW Babcock Hall ice cream at the Memorial Union and start your walk along the Lakeshore Path. At the Porter Boathouse, take a left and walk south, away from the lake, up Babcock Drive. Visit the Allen Centennial Garden. If you missed the ice cream at the Union—or need a second dip– you have another chance at the Babcock Hall Dairy Store! To get there take Babcock Drive to Linden Drive, take a right, and the Dairy Store will be on your left about ½ way down the block. To take the high road home to Memorial Union, head back north on Babcock Drive and turn right (east) on Observatory Drive, taking in the view at the crest of Observatory Hill by Washburn Observatory. Like butterflies? Bring your camera and walk from Picnic Point to the Biocore Prairie in July when the prairie flowers are attracting the most butterflies. Check out the Friends of the Preserve butterfly webpage and try to identify new ones. Hike to the Preserve’s highest point for a great view. Tackle the uphill Eagle Heights Woods trail from the intersection of Lake Mendota Drive and Eagle Heights Drive. At the top of this glacial drumlin, you will reach two magnificent linear Indian mounds and a circular mound. This is the highest point on the south side of Lake Mendota. Like to scuff leaves on a crisp autumn day? 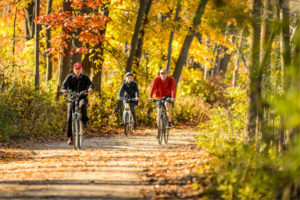 Walk the wide trail from Biocore Prairie through Caretaker’s Woods in September and October when the maple leaves are at their best for scuffing with shoes. Watching for wildlife? Walk the Lakeshore Path between Willow Creek Woods and the entrance to Picnic Point. In spring and summer look for Great horned owls nesting in Willow Creek Woods and painted turtles sunning on logs in Willow Creek. In summer watch the red-wing blackbirds singing and defending their nests in the cattails of University Bay and look for muskrats swimming along the shore, sandhill cranes foraging in the stormwater ponds, and baby toads hopping across the path. University Bay is a great place to view flocks of migrating water fowl in spring and fall. Do you live at Eagle Heights? Walk over to Frautschi Point and explore the Big Oak Trail and look for birds and butterflies on the woods edge with Biocore Prairie. If you’re lucky, you’ll be able to visit with Volunteer Glenda Denniston while she’s hard at work caring for nature and photographing or identifying the creatures of the Big Oak Trail. Learn more about volunteer opportunities here. Interested in prairie and savanna restoration? Visit the upper Bill’s Woods, Big Oak Trail, and Biocore Prairie restorations. Since the 1990s, volunteers including students have been restoring woods, prairies, and a former cultivated field to enhance native plant establishment. Need to get out of the house in the winter? A drive to Picnic Point along Lake Mendota Drive or University Bay Drive after a new snowfall has some dramatic scenery! Bring your skis, snow shoes or hiking boots: touring the trails of the Preserve through the evergreens and thickets of Picnic Point and Frautschi Point is magical after a snowstorm. The dark tree trunks hold patches of new snow as you catch glimpses of the frozen lake through the branches. You’ll get a better view of Lake Mendota from the crest of the bluff in Eagle Heights Woods at this time of year than at any other. Please note, trail are not groomed for skiing. Visit the Interactive Map. Select the WAYFINDING button and click on the “Paths” layer text. ROLL your mouse over the BLUE oval to highlight the wheelchair-accessible trails in the Preserve. Check out our getting here and parking page for close-in parking. Also browse the map for bench and fire circle locations for stopping along the way. Many other areas are accessible for limited-mobility visitors: Muir Knoll, Observatory Hill Overlook, the Class of 1918 Marsh, and others. Please contact us with questions about specific places of interest to you. Browse the Interactive Map. Click the WAYFINDING button to see roads, parking lots, bus stops, and trails. Explore the Places in the Preserve page for information and fascinating stories about the Preserve and it’s history and current restoration activity. RESTROOM FACILITIES: Rustic toilets are located just west of the Narrows. See location on the Interactive map under WAYFINDING > Visitor Amenities. PARKING: See Getting Here and Parking. EMERGENCY CALLBOX: An emergency callbox is located at on the Temin Lakeshore Path behind Social Sciences, at the entrance to Frautschi Point, and at the entrance to Picnic Point. DRINKING WATER: A bubbler is located near the Narrows on Picnic Point. SECURITY: For any security issues in the Preserve, phone 911.